The blue crayfish is generally a common brown papershell crayfish that is missing one gene, causing a color morph. They look like very small lobsters, and make interesting pets when given proper care. Crayfish will often redecorate their homes by moving plants and other decorations around. Many pet shops have blue crayfish, or can order them for you. Be careful to use only reputable shops that care well for the animals they sell. Online retailers also sell blue crayfish that are shipped directly to you. Crayfish can also be found in ponds, rivers and streams where the water is slow moving and shallow. Crayfish are territorial and can be aggressive, so it is best to only keep one in a 10- to 15-gallon tank. If you want to keep more than one, choose a much larger tank with plenty of room for everyone. Line the bottom of the tank with about 2 inches of fine sand or very small gravel for him to dig in. Use plastic rather than real plants, as he will eat real ones. Place castle decorations, PVC pipes or small clay pots lying on their sides to provide plenty of hiding places, especially if you have more than one crayfish in your tank. Set up a filtration system appropriate for the size aquarium you are using to aid in keeping it clean. Crayfish do not require a heater, and enjoy a water temperature between 70 and 75 degrees and a neutral pH of 7.0. 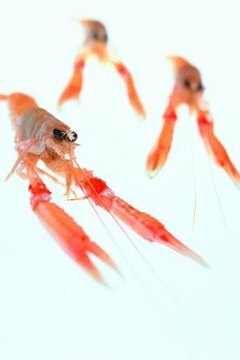 Sinking pellet fish food will provide the basic nutritional needs of your crayfish, but for optimal health and coloring, a diet with a wide variety is best. Frozen or fresh vegetables, such as peas, corn, green beans or potatoes, cut into small pieces and placed in the tank will keep your pet well nourished. They also enjoy small bits of meat as well as live minnows or feeder goldfish. When a crayfish runs out of room in his shell, he will molt. He will shed his shell, usually in one large piece, and go into hiding for the majority of time until his new shell hardens. If there are other crayfish in the tank, or even large fish, he is very vulnerable to attacks and could be easily killed during the several weeks it takes to form a new shell. Provide extra hiding places at this time, or remove other animals from the tank, to keep him safe.